The Knotty Pine, Petersburg, has new owners effective Tuesday, July 5. Justin and Drew Niewohner and Justin’s wife, Betsy, were introduced as the new owners last Saturday night, July 2. 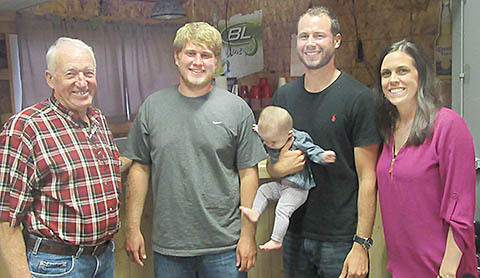 Hank Thieman, l., congratulates new owners of the Knotty Pine (l.-r.) Drew Niewohner, and Justin and Betsy Niewohner. Justin is holding their daughter, Julia, seven months old. The Knotty Pine, Petersburg, has new owners effective Tuesday, July 5. Justin and Drew Niewohner and Justin’s wife, Betsy, were introduced as the new owners last Saturday night, July 2. They said they plan to maintain the Knotty Pine as a popular local gathering point, while also making several improvements. 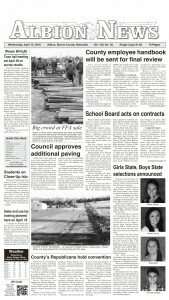 The two brothers said they plan to share most duties at the Knotty Pine. Former owner Hank Thieman will be working with them the next several weeks as they make the transition and learn more about the day to day operations. Complete details in the July 6 Petersburg Press & Albion News Print and E-editions.